Cottage Lake is a census-designated place (CDP) in King County, Washington, United States. The population was 22,494 at the 2010 census. The lake itself falls within the 98072 zip code, while the developments east of the lake fall under the 98077 zip code. Based on per capita income, Cottage Lake ranks 13th of 522 areas in the state of Washington to be ranked. Cottage Lake was ranked #1 in 2013 for the fastest growing suburb in America. 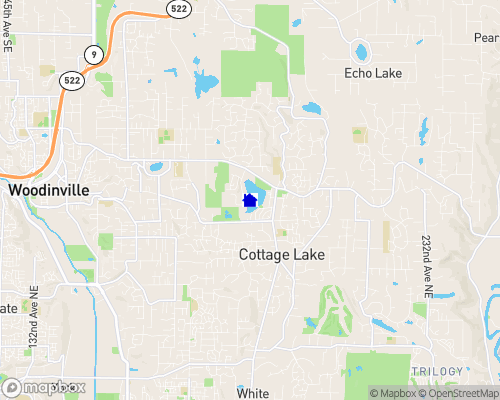 Cottage Lake Park is located near Woodinville and offers numerous outdoor activities for the community to enjoy. Lake access allows for boating and fishing, and there are walking trails, picnic tables and barbeques, a picnic shelter, play area and restroom. The park is also home to the annual “Music in the Park” free outdoor summer community concerts, sponsored by the Upper Bear Creek Community Council. Stocked Rainbow Trout and native Coastal Cutthroat Trout are primarily targeted at Cottage Lake. Additional fishing opportunities include Yellow Perch, Largemouth Bass, Black Crappie, and Brown Bullhead. This lake is one of only ten waters in King County managed with a seasonal fishing closure. Spring catch rates for trout are highest early in the season and decline as fish are harvested and as warmer water temperatures force trout to seek areas of colder refuge. Fall is often overlooked by anglers, but can be an ideal time as fish that have been growing all summer become more active around the lake with cooler temperatures. The lake can be accessed through Cottage Lake Park (King County Parks and Recreation) on the north shore. Car-toppers can be carried to the lake across a short graveled section of shoreline and a fishing pier is available for shore-bound anglers.